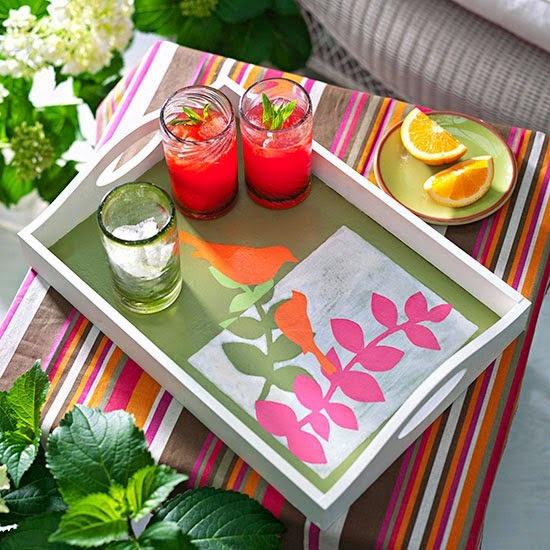 I saw this DIY wooden tray from BHG and I just felt in love with it! DIY projects are always a hit to me coz apart from accentuating my home sweet home, I could also bring out that artistic side of me. This wooden tray was decorated using paints of contrasting colors and some cute patterns. I think you could print out some stencil for the design which in this case is vines and birds. I specifically love it's color combination. I think plain wooden trays can be bought on some local shops and you could even take advantage of their annual sale so you could get this type of tray at a lower price. This will definitely be included in my next list of DIY projects.